These ice cream sandwiches use a chocolate chip cookie recipe I've made before, thanks to Dorie Greenspan. I used a gluten free flour blend for the all purpose flour and mint chocolate chips for the semi-sweet chocolate chips in the original recipe. As for the ice cream, you can go with a homemade version of vanilla or mint chocolate chip or store-bought ice cream... whatever you prefer. I used store-bought this time but links to homemade versions are included below. Whatever you do, enjoy eating these. They're fun, delicious and just might make you feel like a kid again. Working with a stand mixer, preferably fitted with the paddle attachment, or with a hand mixer in a large bowl, beat the butter on medium speed for about 1 minute, until smooth. Add the sugars and beat for another 2 minutes or so, until well-blended. Beat in the vanilla. Add the eggs one at a time, beating for 1 minute after each egg goes in. Reduce the mixer speed to low and add the dry ingredients in 3 portions, mixing only until each addition is incorporated. On low speed, or by hand with a rubber spatula, mix in the chocolate chips. Divide the dough in half over 2 baking sheets. Press the dough onto the bottom of each baking sheet to cover in a thin layer, about 1/2 or less inch thick. Bake the cookies - one sheet at a time and rotating the sheet at the midway point - for 10 to 12 minutes, or until they are brown at the edges and golden in the center; they may still be a little soft in the middle, and that's just fine. Pull the sheet from the oven and allow the cookies to rest for 1 minute, then carefully, cut out squares of the cookie using a pizza cutter. Using a wide metal spatula, transfer them to racks to cool to room temperature. 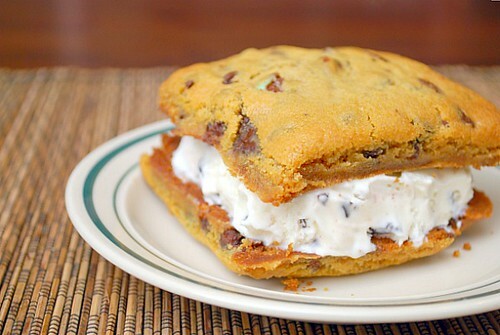 Once cooled completely, add a scoop of ice cream (such as vanilla or even mint chocolate chip) in between 2 cookies and press firmly together to create a sandwich. It's an odd winter when an ice cream sandwich in the middle of February makes sense! Looks great and does sound delicious (going to be in the low 60's today in KC)! Literally, what could be better than that? YUM! I love ice cream sandwiches. They taste so good. I've never tried making my own though. I always thought it would be too hard to get it right. It's great that you don't use mint extract for the chocolate chip cookies, sometimes I put way too much extract in a recipe, and end up ruining the whole thing. What is your recommendation for storage of extra sandwiches? Great recipe, photography and post! Nice blog. I will keep reading. Please take the time to visit my blog about Kundalini Yoga.